As I walked around photographing flowers for this month's Bloom Day post, I was struck by how many of them were blooms I have already showed this summer. Apparently, the flowers of August and early September are pretty long lived. So at the risk of boring you with the same-old same-old, here's what's blooming at Longview Ranch this September 15th: at least I took fresh pictures! First up, a serious contender for my all-time favorite plant: Agastache 'Acapulco Orange'. How can you not adore its gorgeous coloring and summer-long bloom? Its pungent minty scent is an aromatic bonus. It's not just the flowers that are colorful on this NOID Erica - the foliage gets warm orange tips this time of year that combined with the blossoms makes the whole plant glow. 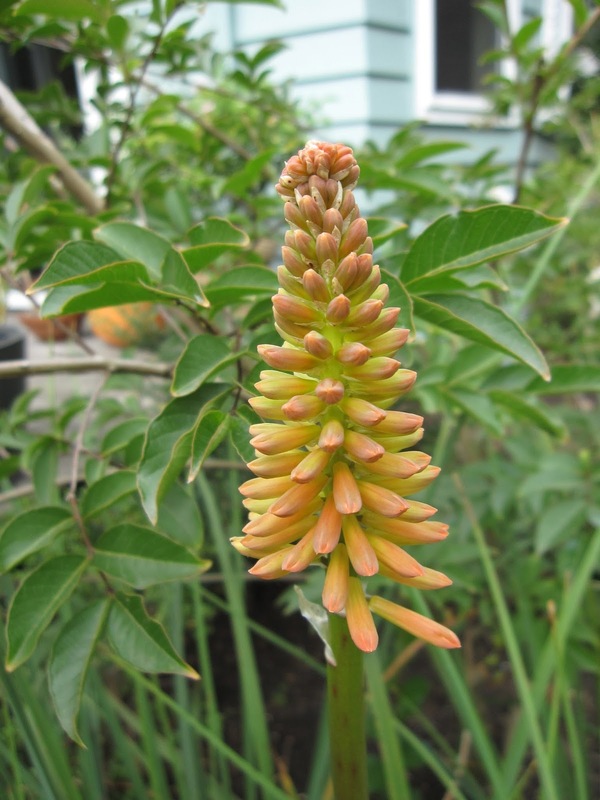 Continuing in an orange vein, Kniphofia 'Timothy' has come blasting back with one last bloom. Rudbeckia triloba is the color hit of my front garden. It's keeping the pollinators happy for sure. The Cistus took a month off blooming and has decided to come back with more of its lovely crinkled flower petals. Loropetalum chinense 'Sizzling Pink' is in a lot more shade than it used to be, and it's quietly continuing to put out more out-of-season blooms. The tiny, bead-like magenta flowers on this NOID Persicaria are impossible to capture with my point-and-shoot camera. I keep trying, nonetheless. Sidalcea oregana factored in my last post. This native is a happy little bloomer. I grow almost no other salvias, but I can't resist the one-two punch of Salvia 'Black and Blue'. That intense color is a hit in the late-summer garden. More in beautiful blue is this Caryopteris, now beginning to wind down. I love the little white flowers on Delosperma 'Oberg'. It's supposed to be perennial and hardy here but I haven't had good luck overwintering it. It grows fast and I buy one (or two) every year so I guess that makes it an annual for me. Lagerstroemia 'Natchez' is still pumping out fresh blooms. I'm taking that as a rousing approval of its spring relocation into the back garden. Garden Blogger's Bloom Day is hosted by Carol, of May Dreams Gardens. Hop over there to see what else is blooming everywhere this September 15th.